Los Angeles- He inspired them to hustle and motivate. On Thursday, thousands of fans showed their appreciation at the STAPLES Center for rapper, entrepreneur and community activist, Nipsey Hussle, born Ermias Asghedom. The gathering, both inside and outside of the official event was the ultimate victory lap– a tribute to a life well-lived. Some traveled thousands of miles and drove hours to pay respects. Many wore custom t-shirts, buttons and hats, featuring special messages. “Evidence of Divine Presence,” read one t-shirt, bearing five photos of Nipsey Hussle’s face. “If I Died Yesterday My Life Would Be A Victory,” read another. Hundreds of fans were already lined up around the STAPLES Center in the wee hours of the morning before 8am. Members of the Nation of Islam handed out free “The Final Call” newspapers bearing Hussle’s face and a story of his legacy. Christopher Richmond, wore a blue and white jacket with the words “MARATHON” emblazoned on the front, part of Nipsey Hussle’s clothing brand. “He meant a lot to me because when I moved to L.A. I didn’t really have any knowledge or faith in myself,” says Richmond, a transplant from Mississippi who says he met Hussle on multiple occasions. “As I listened to his music, it inspired me and kept me going. No matter how much hate and hurt is behind the situation, we will always love him. Despite ticket distribution being limited to residents with a California zip code, many fans came from other states. 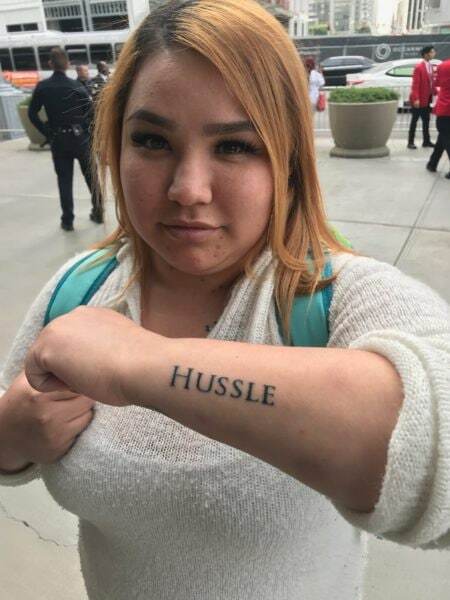 One woman, got Hussle’s name tattooed on her arm and flew from Texas, standing outside hoping for a ticket. Another man, stood outside of the STAPLES Center doing a live painting of Hussle’s image with the letters “TMC” inscribed: The Marathon Continues. He says Hussle was the first person to ever pay him for his art. 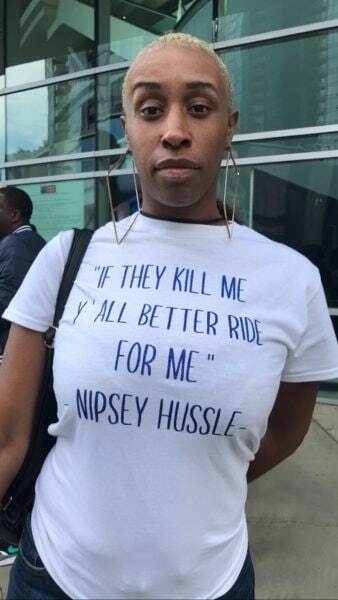 Members of the Eritrean-American community in Los Angeles also came out to pay respects to Hussle, who is both African-American and Eritrean. Many brought flags with them, donning bright green, gold and red, which they proudly displayed inside the STAPLES Center. 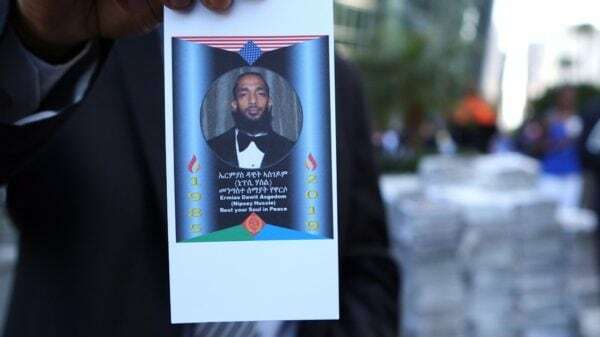 “Nipsey represents the Africans here who have suffered for 400 years but he never gives up,” said Robel Afewerki, who says he attends the same Eritrean church as Hussle’s father, Dawit Asghedom. Holding up a small printout of Hussle’s photo with an inscription written in the Eritrean language of Tigrinya, Afewerki explained why the rapper was seen as a prophet.